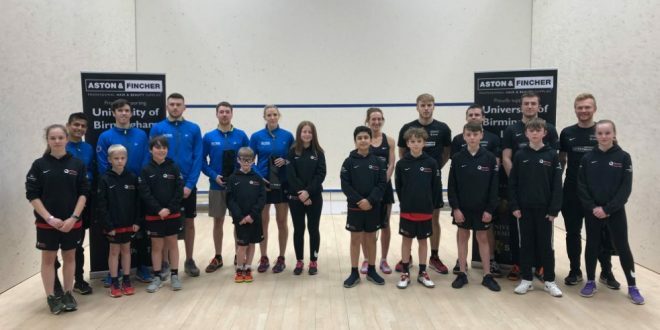 With just three rounds of the regular season to play, and only the top two teams in each group going through to the semi-finals, there were some crucial clashes in tonight’s eighth round of the Premier Squash League, and some nailbiting finishes too. In Group A the top four teams were meeting, so something had to give. Nottingham, needing a good run-in to give themselves a chance of making the semis, were at home to unbeaten leaders Duffield, and got off to a great start when Emma Beddoes beat world number three Laura Massaro 3-2 and Greg Lobban put them 2-0 up with a 106-minute win over Chris Fuller. Eddie Charlton sealed the match for Nottingham with a 3/2 win over Joel Hinds before Andy Whipp and Nick Matthew earned some consolation points for Duffield, who maintain a decent lead at the top of the table. Second-placed Oxford travelled to Chapel Allerton, starting the night in fourth, where the home side forced the tie into a decider, in which Chris Simpson beat Cameron Pilley 3-1 to make it a genuine four-way battle for the playoff spots. Pontefract hosted Birmingham, with both teams having only an outside chance of making the playoffs, and it was the Yorkshire side who triumphed, Siddarth Suchde staving off a comeback to beat Jaymie Haycocks in five at second string to put the Yorkshire outfit 3-1 up, Saurav Ghosal finishing off the visitors. In Group B leaders Exeter travelled to reigning champions Surrey, and the home side stormed into a quick 3-0 lead, finishing off the match 5-0 as Adrian Grant came from two-nil down to beat LJ Anjema in the top string match to put Surrey back on top of the table, leaving Exeter still sweating on making the semis. Third-place Chichester kept up the pressure with a 5-0 away win at Bristol that moved them up to second place, Jon Kemp stunning Mohamed El Shorbagy at number one, and St George’s Hill also took advantage with a 4-1 win at Winchester that kept their slim hopes of progression alive. With Surrey still to play the bottom two teams it would be a surprise if they were not to stay top, and it could well come down to Chichester v Exeter in the final round to determine the other semi-finalist.